In order to survive on this planet, human beings need 3 basic things; air, food, and water. If someone were to start charging us for the air we breathe, we would think that they were absolutely crazy, but paying for food daily we don’t even think twice. Why is it that we have to pay for what is produced naturally by our Mother Earth? Why is it that human beings are the only species who have to pay to eat and pay for shelter? Have you ever asked yourself those fundamental questions? 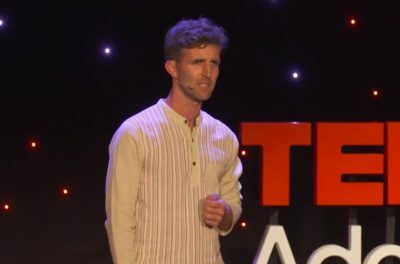 In his TedX Talk, Andrew Barker, Growtester and author for Collective Evolution, raises these questions and more, as he shares his message about what him and his group, Grow Free, are aiming to achieve. Their goal? Simple. To give away for FREE any extra food that they are growing in their own personal gardens. Giving away food for free might sound crazy to some as our minds are so conditioned to be in constant survival mode, someone had to work hard to grow that food, if it’s given away for free, how will they ever be repaid for their hard work? We might think that when there is an abundance of food grown, it goes to waste. How crazy is it that there are people who are starving and we have millions of tons of food being thrown in the garbage every year? Andrew started Grow Free about 4 years ago when he began giving away seedlings in his backyard, and people began coming not only for the seedlings, but to ask how they could help. From there they planted a bunch of sunflower seedlings in newspaper pots and walked down the streets and handed them out to people, for free. Of course, most people are shocked and perhaps a little bit skeptical to receive things for free, but this, of course, is no reason not to do something. This project involves setting up carts around the city and offering any kind of food, but generally locally grown produce, to anyone who might need it, or just want it. Not everyone grows the same crops, so it’s a good opportunity for neighbours to share the fruits of their labour with one another, and with those who don’t have the means to have their own gardens. As Andrew says: “The carts are a medium where people of the community can share with one another, they’re for excess homegrown produce, seeds and seedlings, preserves, eggs, etc. 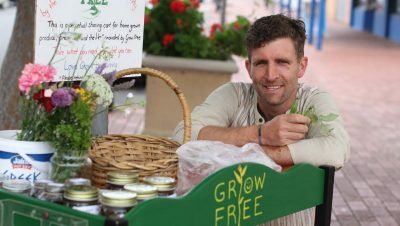 Grow Free now consists of well over one hundred carts set up all around Southern Australia, in just a matter of a few short years. We can all help and support each other, this is a great message and example of the importance and the power of community. Hopefully this movement goes global and other growers from around the world are inspired to share what they’ve grown as well. Just because things have always been done a certain way doesn’t mean this is how they always have to be done. Society is the way it is for a reason and we can choose to opt out of the aspects that are no longer serving to us. We always have a choice. Help each other grow free! 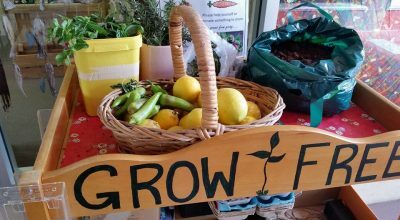 To learn more about Grow Free, what they are up to and how you can get involved, check out their website, here.